This vibrant jam is brilliant with Asian-inspired salads, like the one here; you can also use it in dressings and stir-fries or slather it on chicken sandwiches. The jam Fry the onions in the oil for 15 minutes until caramelised and soft. Add the cumin, garlic, lemon grass, ginger and chillies; cook for 1 minute, then stir in the tomatoes, sugar, vinegar and fish sauce. Simmer, stirring often, for 45 minutes until thick. Spoon into sterilised jars, cool and seal. Store in the fridge for up to 2 months; once opened, use within 2 weeks. Squid salad Cook the noodles according to the pack instructions, refresh in cold water and drain. 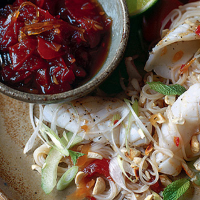 Combine the soy sauce and lime juice with the tomato and chilli jam to make a dressing. Put the noodles in a mixing bowl and pour over the dressing. Mix in the cucumber and tomatoes. Put a griddle pan on a medium-high heat for 5 minutes until smoking hot. Cook the squid in batches for 1 minute on each side. Add to the noodles with the mint and toss. Serve the salad sprinkled with the cashew nuts and with extra tomato and chilli jam and lime halves on the side.